First of all, in order to be able to do recordings in an unencrypted way with comhem you need to use the built-in card reader with the Miraclebox. 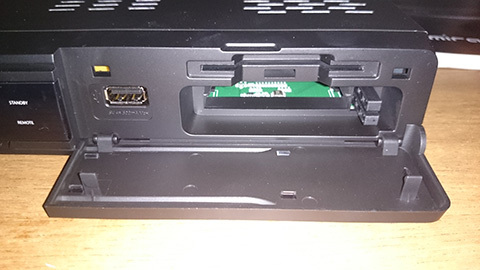 One built-in card-reader at the top and two CA-module slots underneath, and a front usb-port to the left. 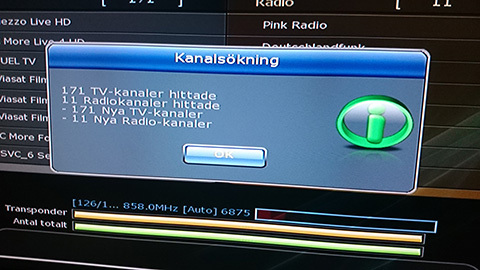 …and then put the paired module (with card) in one of the CA-slots in the miraclebox, but that will make the recordings encrypted and locked for playback to that particular box only. That was not the mission of this project. 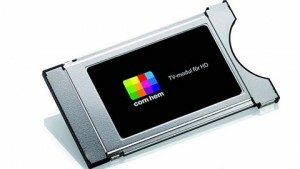 However, most people does only have the basic-plan with comhem which does only come with two HD-channels (Svt1 HD and Svt2 HD), both of which does not require pairing but decryption, hence can be recorded unencrypted with the miraclebox built-in card-reader provided you have a card and a subscription with comhem. In that case, it makes perfect sense to use the built-in card reader since you will be able to record, in an unencrypted fashion, every channel you subscribe to. 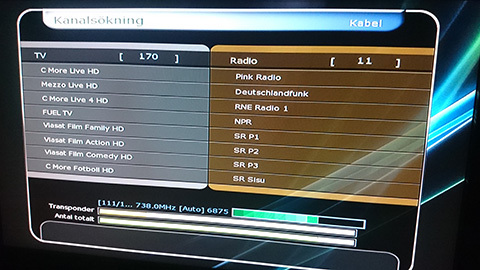 Please note that the following channels, as of June 2015, does not require a card, but only a set-top-box in order to be tuned into. 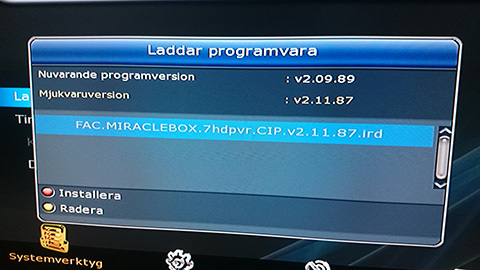 Now download and unzip the file m7-v2-11-87-ci-.zip and put the unzipped file FAC.MIRACLEBOX.7hdpvr.CIP.v2.11.87.ird on a usb-stick. 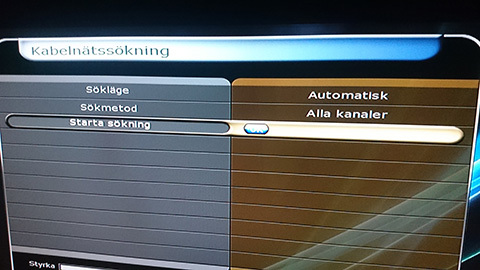 Put that usb stick into one of the usb slots in the miraclebox (front- or back-side doesn’t matter which one). 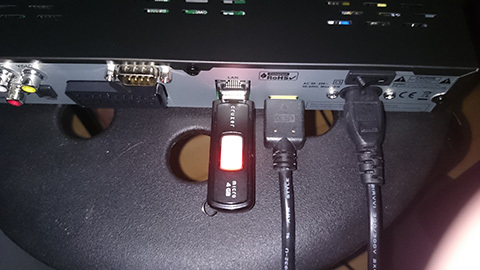 Usb-stick with new firmware plugged into back-side usb port. 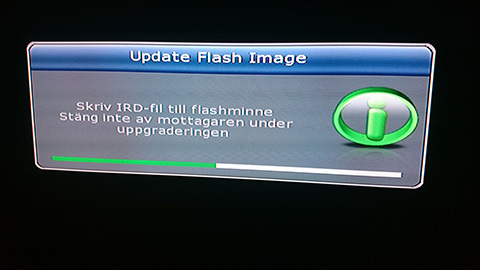 The box will automatically pick up that the new firmware is available. Now, you should be all set for watching and recording your channels. 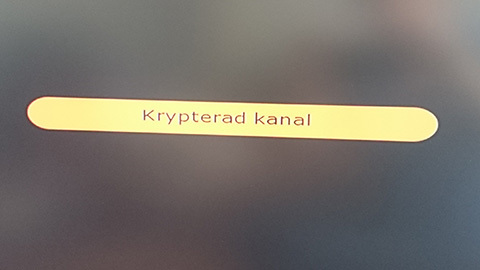 Please note that you need to plug in your comhem card into the card-reader otherwise you won’t be able to watch any encrypted channels in your subscription-plan. This is what will meet you in that case, see below. The chip-on-card should face downwards when inserted into the box. The miraclebox 7 does not have any internal hard-drive slot so you have to use either a usb-drive/stick or some sort of network attached storage. The box will read ntfs drives which is a good thing for plug-and-play operability when moving your recordings to a PC or the like for playback or editing. 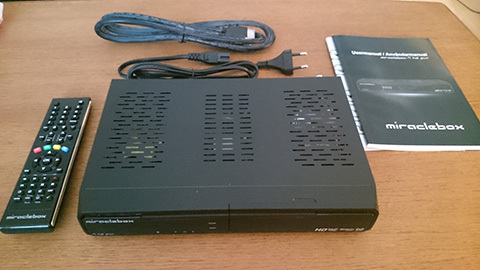 My findings: It works very well to do unencrypted recordings with this box, but one thing to consider is that this box has only one tuner which makes it impossible to record any encrypted channel while watching another. You need a box with at least two tuners in that case. 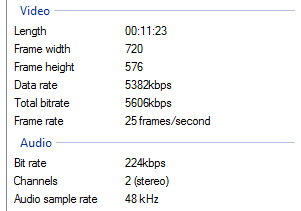 Maybe the VU+ Duo2 or Miraclebox 9 HD C/T2 TWIN is a better option in that case. Please note that sharing any of your recordings with others can be subject of piracy and is not something I support, that is something you must avoid doing. 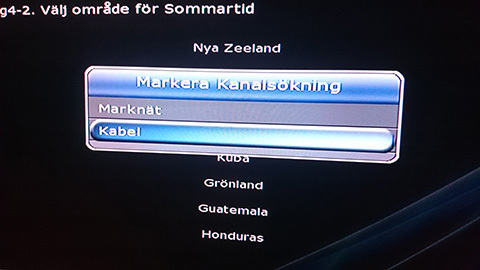 You are allowed to keep copies of your recordings for your own personal use.